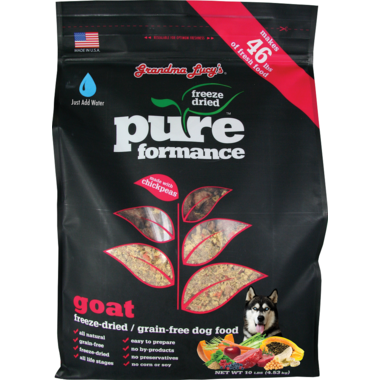 Ingredients: USDA Goat, Chickpeas, Flax, Carrots, Celery, Apples, Bananas, Blueberries, Cranberries, Pumpkin, Papaya, Spinach, Garlic, Vitamin A, Vitamin D3, Vitamin E, Niacin, Iron, Calcium, Phosphorus, Zinc, Riboflavin, Thiamin, Potassium, Manganese, Chloride, Copper, Magnesium, Pyridoxine, Cyanocobalamin. My dog loves it but chokes at times on the grind chicka peas so I have to add more water. Also not very much Goat meat in it for the price u pay.